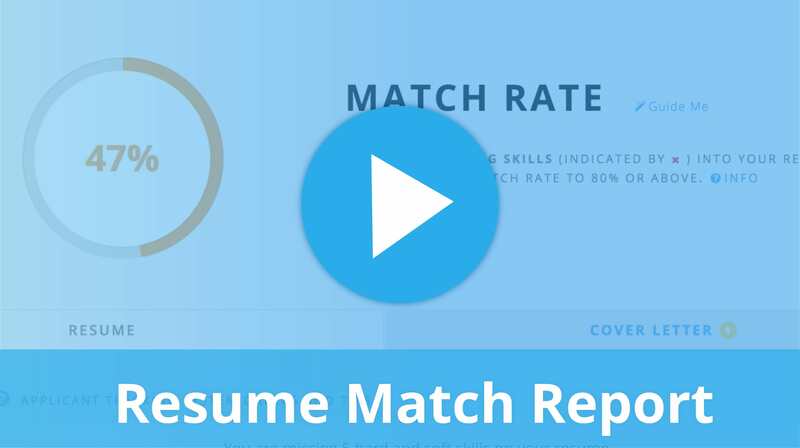 Get started optimizing your resume to beat applicant tracking systems! Welcome to Jobscan! Here is a quick walk through of how and why to optimize your resume using Jobscan. What am I talking about when I say “optimization”? Most companies utilize software known as Applicant Tracking Systems (or ATS) to sort, filter, and rank their job applicants. This means that a hiring manager probably isn’t looking at every resume that gets submitted. Instead, they’re searching for keywords and allowing the system to compile a list of top candidates. If you’re applying through an online job board, you’re applying through an ATS, and optimizing your keywords is critical to your success. Applying through an online form? That’s ATS. This is the resume scanning tool found on the Jobscan.C-O homepage, or in your dashboard if you’re logged in. This is where you’ll enter your resume and the job description for which you’re applying. The first thing you need to do is paste in or upload your resume. I’ve got a my resume copied and am pasting it here in the left box. Next you’ll need the job description. Here’s a listing I found online, I’ll copy everything from the Job Title down through the end of the qualifications and requirements and paste the text into the box on the right. This is the match report. You can see at 36% I have some work to do. Jobscan recommends an 80 percent match rate or higher to ensure being a top result in the ATS. Improve your score by addressing as many Red X’s as possible. Jobscan offers suggestions based on your resume’s particular components including measurable results, which ATS you’re applying through and most importantly hard skills, or keywords. Focusing your attention on this section is the key to tailoring your resume to a specific job. After you’ve made changes, click “Rescan” on the left sidebar to re-upload your resume and see your score progress. Rinse and repeat. Register at Jobscan to save your results and track your job applications.